A couple weeks ago I shared a post for the unmarried ladies on Praying for your Future Husband. Apparently these dear single sisters are still on my heart because here is another post mostly for them, but also just a little bit for those of us who are married. All of those are great things to know, but I think being prepared for marriage is a bit more than just that. 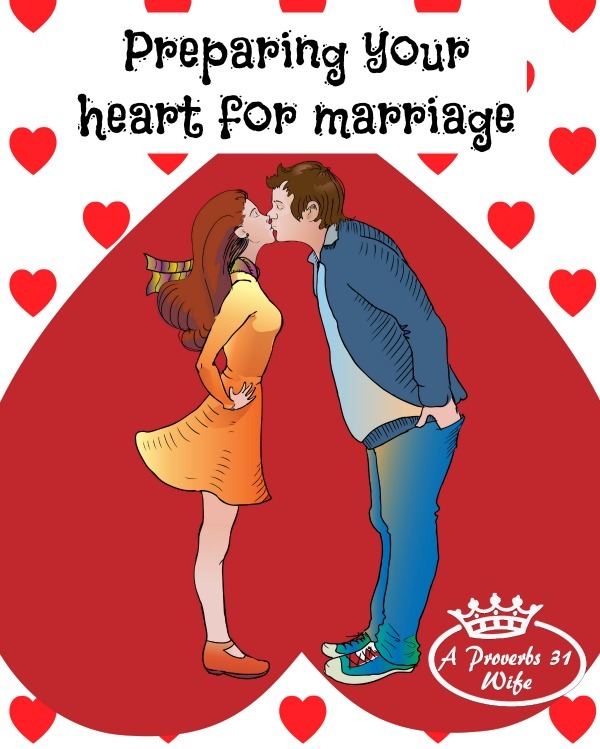 Being prepared for marriage needs to go farther than just physical preparations. It needs to start in the heart. When I look back at the single me, I see that I was focusing on learning housekeeping skills, and how to cook. I was praying for my future husband yes, but I’m not so sure I was really preparing my heart. In marriage a wife is to respect her husband, and yes, to submit to him as well. She is to show him honor and realize that she is no longer alone, but has someone to lean on and be protected by. By nature I am a very independent woman. I tend to figure things out on my own, take charge and sometimes be very careless about other people’s feelings. Independence is good, thoughtlessness is not. So how could I have done a better job at being prepared for marriage? First and foremost by remembering that I was not alone even then. Even if a girl doesn’t have her dad to protect and cherish her as a dad should; she always has her heavenly father. Too many times I tried to just do it on my own without taking it to the Lord in prayer first. It stands to reason then that some of our conflict in our early years of marriage came from me forgetting that I had a partner and just doing things without remembering to consult my husband. Another thing is the way I tend to be so wrapped up in what I’m doing that I fail to notice others around me. Thus I was insensitive to my husband’s needs because I was so focused on my own. I know there are many more ways to prepare your heart for marriage, but for me those are probably the two areas I would have done well to worked on before marriage. Being prepared for marriage on a heart level. Number 2. Be aware of others and sensitive to their needs. Now as a married woman, I have had to learn to consult the Lord and my husband, and to be sensitive to his needs. Thanks so much for hosting your lovely party!! This was really a good and helpful post for those looking to be married, those newly married, and those married for years. thank you Kendra for taking the time to post this. Thanks too for hosting the linkup party today. Oh, and I enjoyed reading your post on couponing too. I admit that even at 34 I was so unprepared for marriage, I think I would have paid to get out the first year or so. Sigh. Marriage is work and I’m so glad we’ve stuck it out for 16 years.